Lightly grease the inside of a 1kg / 2lbs loaf tin, then line it with two layers of Clingfilm, leaving a lot hanging out. Break the chocolate into pieces, place in a heatproof bowl and melt the chocolate over a pan of simmering water or in short blasts in the microwave stirring regularly. Stir in the fleur de sel/coffee and set aside to cool for 5 minutes. While the chocolate is cooling, whisk the eggs and sugar for 3-4 minutes, or until pale and fluffy. Stir the cooled chocolate into the egg mixture. In another bowl, whisk together the cream and vanilla seeds until soft peaks form. Add the whipped cream to the chocolate mixture, then fold in the pistachios. Cover with the overhanging Clingfilm and freeze for at least 3 hours, ideally overnight. 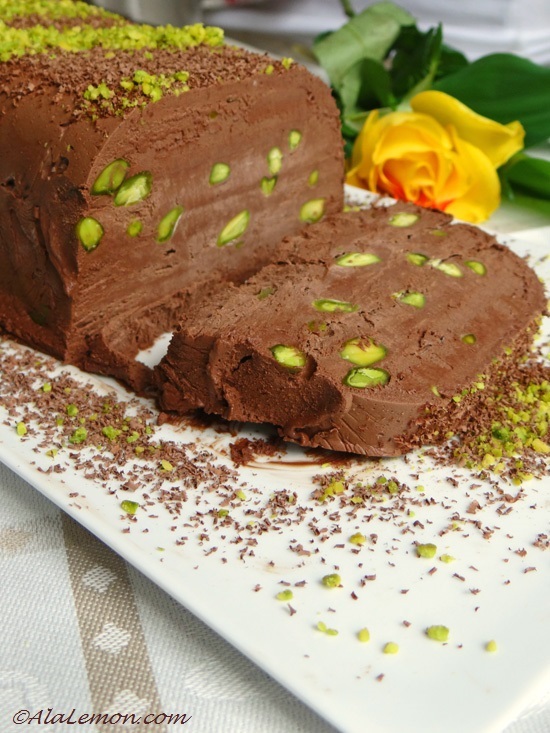 Remove the tin from the freezer 10 minutes before serving to allow the semifreddo to soften a little. Peel back the top Clingfilm layers and turn onto a serving plate. 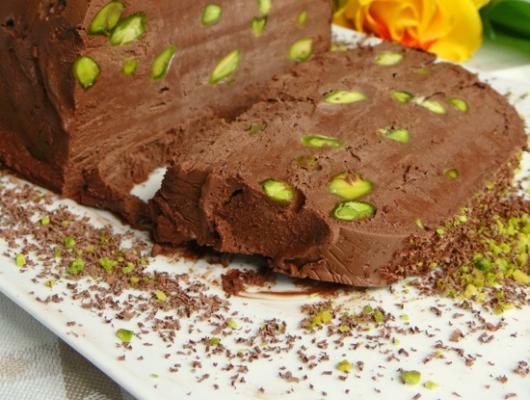 Decorate with a little grated chocolate and ground pistachios over the top.